Onyx Mesh Literature Organizers in classic Black offer an intriguing design and a smart way to make efficiency more convenient. Features simple, modern design made from Steel Mesh Construction. 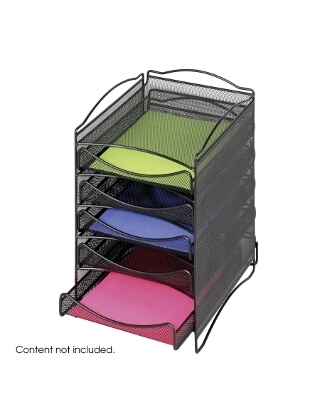 This five compartment organizer has 1 5/8" deep drawers for papers and letter size file folders. Connector clips are also included allowing units to be easily stacked 2 high. Fully assembled.